EPCO's UF Stretcher Kit is designed to simplify UF Cable repairs after a trencher has damaged or destroyed a 7" to 10" section of UF Cable. 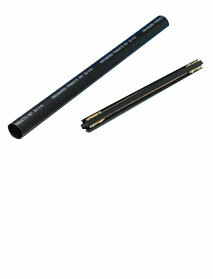 Utilize EPCO's Thick Wall Heat Shrink Tubing with with sealant to make a quick and reliable repair. Eliminates epoxies, tapes or separate mastics and creates a waterproof splice. The kit includes one (1) 4-position, 11.5" connector and one (1) piece of heat shrink tubing, designed to splice and insulate 14 AWG to 8 AWG UF Cable. Labor Savings! Includes one 11.5" connector that eliminates the need to use two (2) connectors and a short piece of cable when repairing a longer section of damaged UF Cable. 600 Volt maximum,105°C (221°F) rating. Eliminates the use of two (2) UF Cable Splice Kits (P/N: UFC2B) and a short piece of cable.